In terms of your health, one of your very best friends is your liver. It works tirelessly for you, performing myriad critical functions, keeping your body pure of toxins and harmful substances. It supports nearly every other organ in the body in some way. We are all besieged daily by various substances that are foreign to normal body function. Pesticides, petrochemicals, plastics – and I’ve just mentioned a few that begin with “p”. Sadly, there are certainly toxins that begin with all of the other letters of the alphabet as well. I was reading an article discussing a paper published in the European Journal of Medicinal Chemistry. It stated that more than 10 percent of the world’s population suffers from some form of liver disease. It also mentioned that many of these people choose natural remedies instead of pharmaceuticals as their therapy. Glad to hear that. Liver cleansing is near and dear to my heart and I’ve been using herbal formulations for decades to support healthy liver function. What’s really remarkable about these herbs is that they are time and tradition tested across our globe, and found to be safe and effective, without the harmful side effects that we regularly encounter with man-made chemical medications. So now let’s celebrate some natural herbs that can provide you with protection against liver cancer and various other forms of liver damage. Yes, there is a lot you can do to safeguard this essential ally of your health. Turmeric, whose active ingredient is curcumin, has been extensively used in traditional Asian medicine to treat gut issues, arthritis, and low-energy or fatigue. It demonstrates anti-inflammatory, antioxidant, and anti-cancer properties. No wonder it gets such great press as one of the world’s healthiest foods! Skullcap, active ingredient wogonin, has shown positive results in studies relating to Hepatitis B and C, as well as various forms of alcoholic and non-alcoholic fatty liver disease. Interestingly, it has also been used in the treatment of a wide variety of nervous conditions, including epilepsy, insomnia, and anxiety. Licorice Root, active ingredient glycyrrhizin, exhibits powerful anti-inflammatory and anti-viral properties. In Chinese medicine licorice root has long been used to protect liver function and also to combat tumors, and is widely recognized as a go-to support in cases of chronic hepatitis. Resveratrol is known widely for it’s anti-aging properties. It’s not surprising that it also protects the liver, helping to guard against the damage caused by free radicals and inflammatory processes. Resveratrol elevates levels of glutathione and promotes antioxidants in the body. It shines as a great liver-supporting herb. Milk Thistle, active compound silymarin, is probably the most well researched supportive herb for the liver. Used medicinally for over 2,000 years and appreciated as a strong “liver tonic” worldwide, it is used extensively in preventing and even reversing liver toxicity caused by toxins and drugs. And if you heard that milk thistle should be avoided due to its possible effect on estrogen, disregard that information. Although some parts of the plant contain phytoestrogens, clinical evidence shows no significant effects on estrogen levels, and in fact is potentially beneficial for estrogen dominant conditions such as breast cancer. There are many excellent liver cleanse formulas that contain most if not all of these fine herbs. As I discuss in my book, Gut Solutions, a liver cleanse is recommended for everyone. 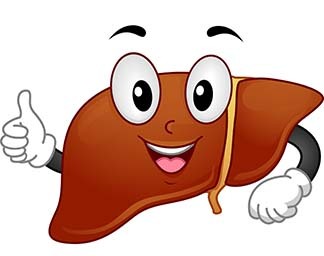 Always remember – Good Liver, Great Life!